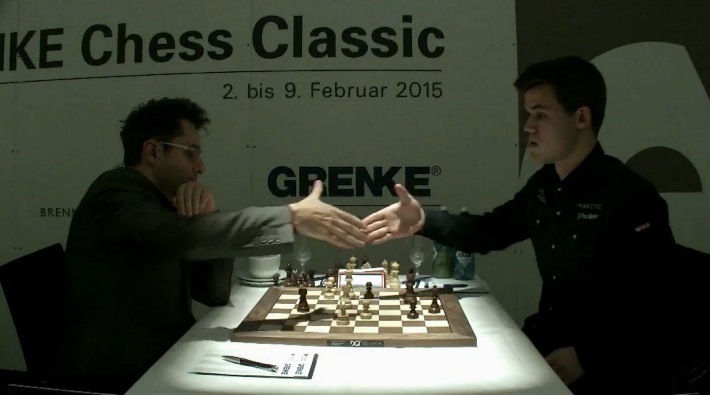 A heavyweight battle between Levon Aronian and Magnus Carlsen was the highlight of the first round of the 2015 GRENKE Classic, with both players managing to put real pressure on their opponent before agreeing a 64-move draw. Elsewhere Etienne Bacrot rushed just when he seemed about to put David Baramidze to the sword, while Caruana-Anand and Adams-Naiditsch were less eventful, though there was some great post-game commentary that you can rewatch below. I don’t know if David realises this, but everyone but him is a current or previous Baden-Baden player, and the plan was to gang up on him! Jan added, though, that David hadn’t read the script. It might be more accurate to say that Etienne forgot his lines, since at this point he “hallucinated” a mate, playing 27.Nce4 gxf3 28.Rh8+ Kg7 before realising that his planned 29.Rdh1?? would run into 29…Nd2+ and it’s actually Black who wins! He was therefore obliged to take a draw by repetition. There were two draws that never quite caught fire, although the post-game interviews revealed that, as usual, we only saw the tip of the iceberg. Fabiano Caruana opened with the “patriotic” Italian Game, and was perhaps a little taken aback when Nigel Short began the press conference with, “Your opening was a little bit flaccid”, to which an on-form Vishy Anand responded: “The English commentator is making his mark!”. 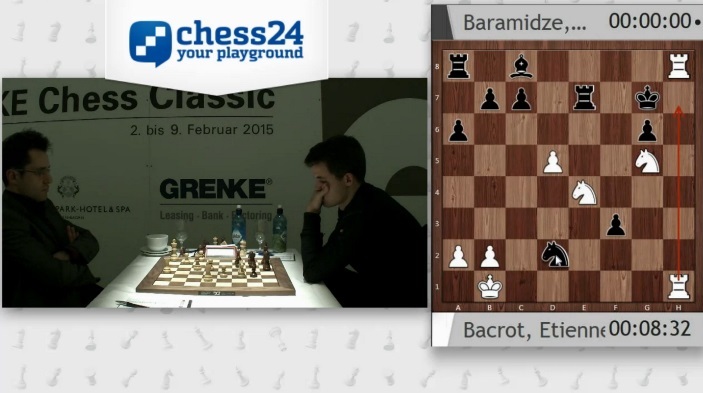 Caruana said 6.b4 was an over-the-board choice and then described his 10.h3?! as “probably unnecessary”. It could have led to some great entertainment, since Caruana pointed out he’d been very concerned about lines like 19…Bxh3 20.gxh3 Qh4 21.Kg2 and then the stunning 21…Rd2!! Short: These are great tactics, and probably not working. 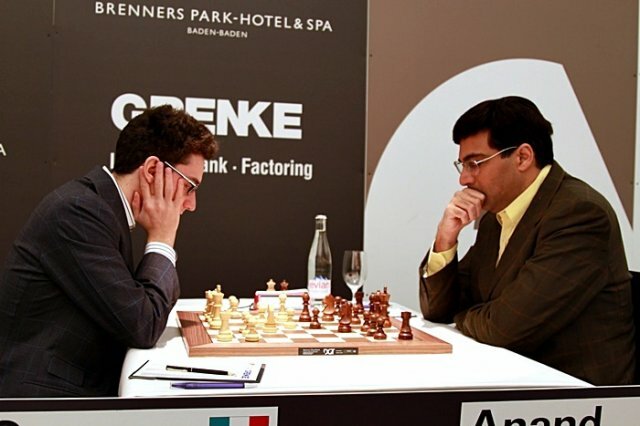 Anand: Like all great tactics! “Flaccid” would perhaps have been overly generous of the French Tarrasch opening that Michael Adams himself called “a bit dismal”. To play a little bit better than today! 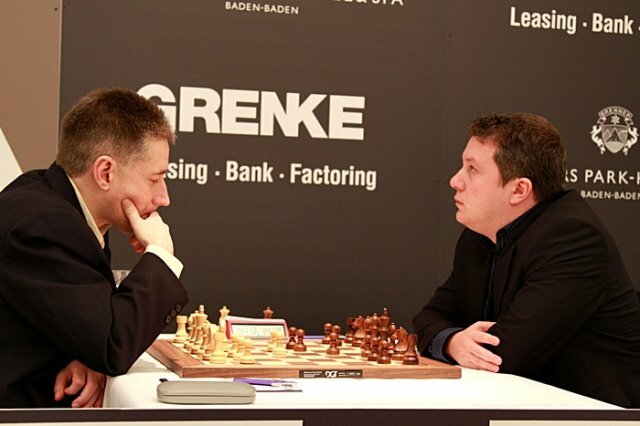 It was noted that Naiditsch had won his last supertournament ten years ago in Dortmund in 2005. 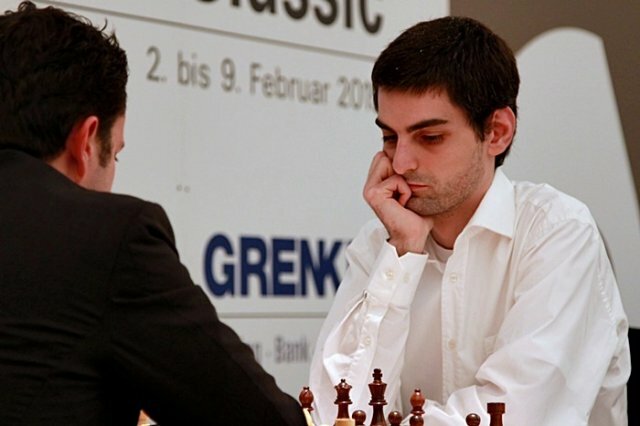 He added that he’d won the European U10 Championship a decade earlier in 1995, to which Jan helpfully chimed in with, “and you were born in 1985!” Is this Arkadij’s year? 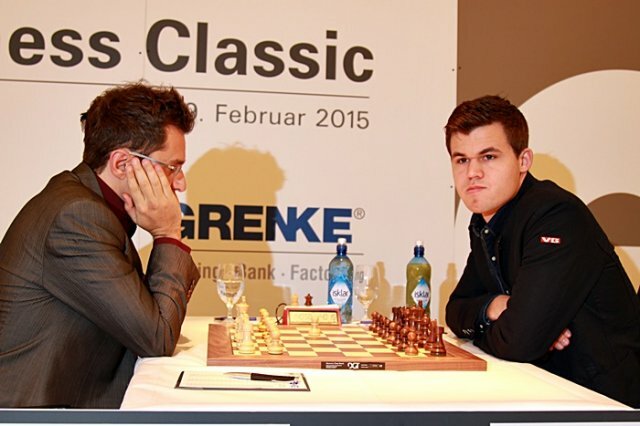 And that leaves the day’s headline clash between World Champion Magnus Carlsen and the “the former world no. 2” (as he was christened by Jan) Levon Aronian. The Armenian had said in an interview late last year that his favourite opponents are Kramnik and Carlsen, since, “they’re the most complex to play against, but I’m drawn to complexity”. Careful what you wish for, as today’s game was certainly complex, even if neither player could quite land a killer blow. I’m forced to put my pieces on some strange squares. Still it’s fairly solid, but a bit sucky. But the way he played the move was the problem: “36.Rg1 was ok, but spending 7 out of my last 8 minutes on it…” After 36…Rd8 he played the “ridiculous” (Aronian’s word) 37.Qh2?! and the advantage was gone. 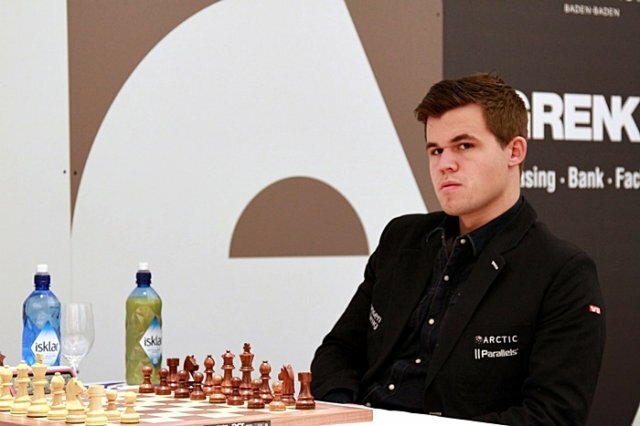 It was just around this point that Jan had commented, “if Carlsen survives the next 3 moves he could well be better,” which proved prophetic, but once again, as often happens at the start of a supertournament, the defender was up to the task, and even the legendary torture techniques of the Norwegian couldn’t quite bring home a full point. Jan pointed out that we have the four highest rated players playing the four lowest rated players, so, “it’s a pretty safe bet that there aren’t going to be four draws tomorrow”. If that’s not jinxing things, we don’t know what is… but here’s hoping!